Why are we the top, experienced, and high-quality Christian writers, editors, and ghostwriters for hire? Simply put, we view our work as a ministry. That is why we only work on Christian material. We also have real-world success, meaning we are results-oriented writers. That is truly what you need. Do you have a testimony, teaching, or story from the Lord, but your book has been on the “to do” list for years? Maybe you feel overwhelmed, stuck, or just don’t have the time or skill to write the book God has given you? I know your struggle. I've been there, and I think we can agree it is a frustrating, and sometimes guilt-ridden place to be. This is exactly why I founded Uberwriters as an exclusively Christian writing company in 2009. God led me to start this company to help believers get their messages out in an effective, powerful way. All glory to God, today we are veteran Christian writers and editors with high publishing success. Our calling is to expertly assist authors to write their books, website content, ministry blogs, articles, and much more, in all the excellence that honors God. We take your notes, outline, or manuscript--or if you don't have one, we transcribe interviews to get your book's source material. We remove the pressure, and we make it easy to get the Spirit-inspired message from your heart to the page, in the most compelling way. "...we make it easy to get the Spirit-inspired message from your heart to the page, in the most compelling way." We can also help with everything from powerful book publishing proposals, to building your social media presence with a specific publishing strategy in mind. This ensures you have a strong following when your book launches! With our decades of combined writing experience, we’ll work with you to perfect your idea, then structure your book so it starts with a BANG, and develops with a gripping middle. Your book will deliver powerful "take-aways" in a profound but accessible style, and conclude with a HUGE payoff for the reader. Our goal is to have people talking about your book for years! WRITING YOUR BOOK IS OUR CALLING! Would you like to read some samples of our work with previous clients? Contact us and we'll send you sample chapters, and two of our effective publishing proposals that landed both of these clients deals within a week! See Brad's Latest Collaboration with Christian Radio Celebrity and Pro-life Speaker, Mark Morrow! 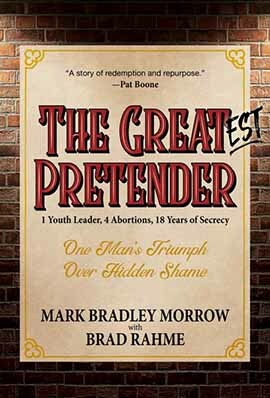 "Mark Bradley Morrow: Christian Radio Celebrity, Youth Leader, Counselor, and Father of Four Aborted Babies. What a headline that would have made in the Erie Times. Mark wished he could get off so lightly as to only have his hypocrisy exposed, but there would be no headlines about Mark Bradley Morrow, and the three women he impregnated. Instead, he would continue speaking in churches, counseling teenagers, and co-hosting a show on a DOVE-nominated radio station for eighteen years..."
We put the kingdom of God first in all we do. We see our writing as a gift to be used for the advancement of the kingdom of God. We know which publishers and agents specialize in various genres, which Christian BISAC categories to target your book towards, we know how to position you for the highest chance of landing a “Big 8” publisher. We can also write for a highly academic audience. When necessary, we are well-versed in scripture and sound doctrine, and writing for a deeply theological audience. Founded in 2009, Uberwriters is the original Christian ghostwriting firm. In the many years since, we’ve been writing successful Christian books for clients, and have mastered the process. We are veterans in Christian writing, editing, self-publishing services, social media, and marketing. Contact us today to see how we can get your book written and published. Most important, we are exclusively Christian ghostwriters. This means we pray and seek the Lord every day, we have a lifetime of Bible knowledge under our father’s ministry, and we pursue a deep, daily relationship with the Lord. It also means we only work on Christian material, so you don't have to worry about our focus. This makes all the difference in the spiritual quality of your book! This, of course, does not mean we only write books that are overly preachy. Not at all; we understand that many books need to appeal to the unchurched, and lay-readers. We are very experienced in writing so complex spiritual topics are simple and understandable for all readers. Basically, if your book glorifies God, we'd love to write it. "We understand that many books need to appeal to the unchurched, and lay-readers." We believe our writing is a calling to serve the Church! We love studying new ways to reach and affect the modern Church and, of course, reach the unsaved with the Good News. Romans 8:14 says "Those who are led by the Spirit are the sons of God." We rely on Him for every project and that means we will be totally aligned with your vision. You will see the Holy Spirit's intended results for every project! This creates a spiritual insight that goes far beyond some formula for your ministry's creative needs. We love what we do and see it as a gift from God. We’re highly motivated and when you succeed, we succeed! Adding to our spiritual knowledge, we are also, of course, highly experienced writing professionals. Keep reading to understand how we are really Christian writing collaborators, instead of Christian "ghost" writers. We Offer ALL the Complementary Services to Send Your Book to the Top! When we get started working on your book, we offer a comprehensive suite of services to strategically position you for maximum publishing success by the time your book launches. Contact us today to see how we can not only get your book written and published, but strategically position you for maximum publishing success! In the same way, our calling is to help you write your message from the Lord, in all the excellence He requires. You wouldn’t try to design and build a house alone would you? Sure, you could get some software, design the layout, and plan it all out, but nobody would expect you to be responsible for everything being up to code, and knowing how to frame and drywall, right? Why Choose Uberwriters to Write Your Book? We also know the difference between positively controversial and what might bring reproach. Guiding our clients in the Christian market is one of our strengths. "...our calling is to help you write your message from the Lord..."
Many authors overlook the critical aspect of hiring an exclusively Christian ghostwriter or editor but think about it… writing only Christian books means we will not work on something weird—like a horror script one day, then start working on your manuscript the next day. We are Christian writers, and we only work on Christian writing that edifies the reader, and furthers the kingdom of God. Also, Uberwriters is not a referral agency—we have three Christian ghostwriters on staff, and this is who does the writing. That means we will never subcontract to the lowest bidder, (who may not even be a first-language English speaker,) then try to “polish” the manuscript on the fly. At Uberwriters, either Brad, Grant or Hilton will do the writing. We work with all integrity, and we view our work as a ministry, to further the kingdom of God. We have decades of combined experience writing Christian books. We have written Christian fiction, powerful autobiographies (life testimonies,) Christian self-help (hot genre right now,) Teaching, Eschatology, Sermon Series to Books, and much more. Take a look at our Christian Book Writing services to see how we can help you write and publish your dream book. The path to landing your book on a bestseller list is specific and strategic. Achieving bestseller status means selling a specific amount of copies in a specific genre, in a amount of time. Fortunately, we can help you navigate this path. "...the path to achieving bestseller status is very specific and strategic." Building your platform is a great way to increase the number of pre-orders you take. While we write your book, we can help you build your online presence, writing great blogs and powerful social media posts to build your following and base. Uberwriters offers many complementary services such as editing, blog and article writing, social media presence, book website design, and Search Engine Optimization services, which are very important for building your platform. The bigger your platform, the further your reach, which means more people interested in your book. Our Christian self-publishing services include book cover design, interior book layout, eBook conversion, and complete set up for worldwide print & online distribution. If you prefer the traditional publishing route, we write powerful book proposals and can help you find the right agent or publisher, and get you into the right book stores! All of our services synergize into one, powerful result: your best chance of landing on a bestseller list, and a vast ministry platform to reach the world! We remove the creative burden with our proven writing expertise. Do a market analysis to ensure your book targets the optimal audience. Write in your voice, using your typical language, yet in a highly engaging style. Use advanced literary techniques like cliffhangers, widows, red herrings, etc. Our goal is to keep your reader awake and flipping pages, when they should have been asleep hours before. Provide the highest chance of being picked by a major publisher. Many of our client's manuscripts have not only been published, but are moving some serious volume! Our spiritual sensitivity will intuitively grasp the essence of your message, so we can develop and interpret the little nuances that make all the difference in Christian writing. You won't have to spend hours explaining to a secular writer, the spiritual truths behind your core message. What are you waiting for? Call or email today!